Priyanka Chopra has a pretty great story in her own right. Since the premiere of ABC’s drama “Quantico” in 2015, she has been getting a lot of attention for becoming the first South Asian actress to lead an American series. In an interview at the 10th Annual Women In The World Summit 2019, the actress revealed that she, too, had faced sexual harassment at one point of time. During the course of her conversation with Brown which ranged from her grand wedding with Nick Jonas to culturally different of Bollywood. The actress spoke about women empowerment and the #MeToo movement. Further commenting on the movement, which was triggered by actress Tanushree Dutta in India, Priyanka expressed, “Now because of the support we are giving each other, people don’t have the power to shut us down,” she said at the Summit. “We always had a voice. Just nobody heard us. Now because of the support we are giving each other, nobody can shut us down. 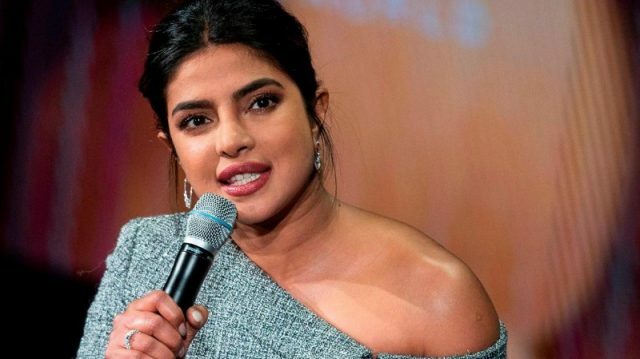 Priyanka claimed that even she had faced sexual harassment and appreciated that now women are brave enough to come out and speak about their ordeal. When she was categorically asked if she has ever faced it, she replied, “everybody in this room has probably faced one because it had become a norm with women”. Priyanka reveals about the plans on curating a Bollywood type production for American audiences. She hinted that she might bring the imminent elements of Bollywood like singing and dances to the U.S film industry. “Give me another year and a half,” she said. “I have a few things up my sleeve,” she added. The actress added that like many before her, she was also offered “ethnically ambiguous parts” in Hollywood. “It took me all those ethnically ambiguous parts to be where I am today. I did not want to do stereotype roles because then all you will see is what I already know I can do. I am Indian, I can do that,”. Next articleSsharad Malhotra and Ripci Bhatia’s Roka ceremony’s picture LEAKED!